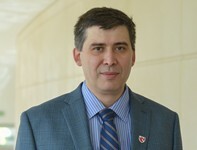 UNMC › Pathology and Microbiology › Faculty › Bios › Marat R. Sadykov, Ph.D.
King, A.N., Borkar, S., Samuels, D.J., Batz, Z., Bulock, L., Sadykov, M.R., Kenneth W. Bayles, K.W., and Brinsmade, S.R. Guanine limitation results in CodY-dependent and -independent alteration of Staphylococcus aureus physiology and gene expression. (2018) J. Bacteriol. 200(14): e00136-18. Svechkarev, D., Sadykov, M.R., Bayles, K.W., and Mohs, A.M. Ratiometric Fluorescent Sensor Array as a Versatile Tool for Bacterial Pathogen Identification and Analysis. (2018) ACS Sens. 3(3): 700–708. Mlynek, K.D., Sause, W.E., Moormeier, D.E., Sadykov M.R., Hill, K.R., Torres, V.J., Bayles, K.W., and Brinsmade, S.R. Nutritional regulation of the Sae two-component system by CodY in Staphylococcus aureus. (2018) J. Bacteriol. 200(8): e00012-18. Sadykov, M.R., Ahn, J-S., Widhelm, T.J., Eckrich, V.M., Endres, J.L., Driks, A., Rutkowski, G.E., Wingerd, K.L., and Bayles, K.W. Poly(3-hydroxybutyrate) fuels the tricarboxylic acid cycle and de novo lipid biosynthesis during Bacillus anthracis sporulation. (2017) Mol. Microbiol. 104: 793-803. Halsey, C.R., Lei, S., Wax, J., Lehman, M.K., Nuxoll, A.S., Laurey Steinke, L., Sadykov, M., Powers, R., and Fey, P.D. Amino acid catabolism in Staphylococcus aureus and the function of carbon catabolite repression. (2017) mBio. 8(1): e01434-16. Sadykov, M.R. Restriction-Modification Systems as a Barrier for Genetic Manipulation of Staphylococcus aureus. (2016) Methods Mol. Biol. 1373:9-23. Gries, C., Sadykov, M., Bulock, L., Chaudhari, S., Thomas, V., Bose, J., and Bayles, K. Potassium uptake modulates Staphylococcus aureus metabolism. (2016) mSphere. 1(3): e00125-16. Chaudhari, S.S, Thomas, V.C., Sadykov, M.R., Bose, J.L., Ahn, D.J., Zimmerman, M.C., and Bayles, K.W. The LysR-type transcriptional regulator, CidR, regulates stationary phase cell death in Staphylococcus aureus. (2016) Mol. Microbiol. 101: 942-953. Waters, N.R., Samuels, D.J., Behera, R.K., Livny, J., Rhee, K.Y., Sadykov, M.R., and Brinsmade, S.R. A Spectrum of CodY Activities Drives Metabolic Reorganization and Virulence Gene Expression in Staphylococcus aureus. (2016) Mol. Microbiol. 101: 495-514. Marshall, D.D., Sadykov, M.R., Thomas, V.C., Bayles, K.W., and Powers, R. A redox imbalance underlies the fitness defect associated with inactivation of the Pta-AckA pathway in Staphylococcus aureus. (2016) J. Proteome Res. 15: 1205-1212.